‘When I was young I wanted to make a billion dollars. Today, I want to save a billion lives.” – Ganesh Muren. A plucky 24-year old with a passion for engineering and a penchant for entrepreneurship, Ganesh Muren is also known for his deep commitment to driving social impact in marginalized communities. 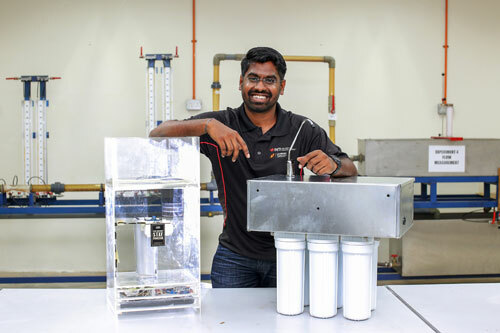 A solar powered water filtration system he developed while at INTI has helped him combine his passion with a mission to save lives in underserved communities and this has also earned him the highest accolade for students driving social change within the Laureate International Universities network which is present in 28 countries. INTI International University and Colleges where he honed his engineering expertise, is a member of the Laureate network. Founder of Saora Industries – Muren – has put his entrepreneurial and engineering skills to good use by getting the solar powered devices which produces clean water and electricity, placed in rural Orang Asli communities and other villages across Malaysia. His invention uses solar energy to power the pump that accelerates the output of water which has been through a tiered filtration process. Excess solar energy is then used to power the generators in small villages with limited access to electricity. Muren, through Saora Industries hopes to reach over 10,000 households by 2018, and his US$10,000 cash award will promptly be reinvested into the business he founded. “From selling grasshoppers when I was a young boy for some extra pocket money to developing a device that could potentially save lives – I have always believed that perseverance, creativity and hard work pays off in the long run. When I started this journey, my goal was to help a young 6-year old Orang Asli girl lead a normal and healthy life through access to clean water. She didn’t survive long enough for me to help her but her legacy will save many lives,” he said. “Ganesh is a great example of a student who develops practical solutions to serious problems while generating jobs and benefiting the community” shared Rohit Sharma, CEO, INTI International University & Colleges. Muren received his award from the Founder, Chairman and CEO of Laureate International Universities Douglas Becker at a ceremony in Chicago last week, where he also shared his personal journey of becoming a social entrepreneur.